The device will look almost identical to the current Xbox One S, but without a drive slot. There isn't any major change in the new Xbox except for the absence of the disc drive. 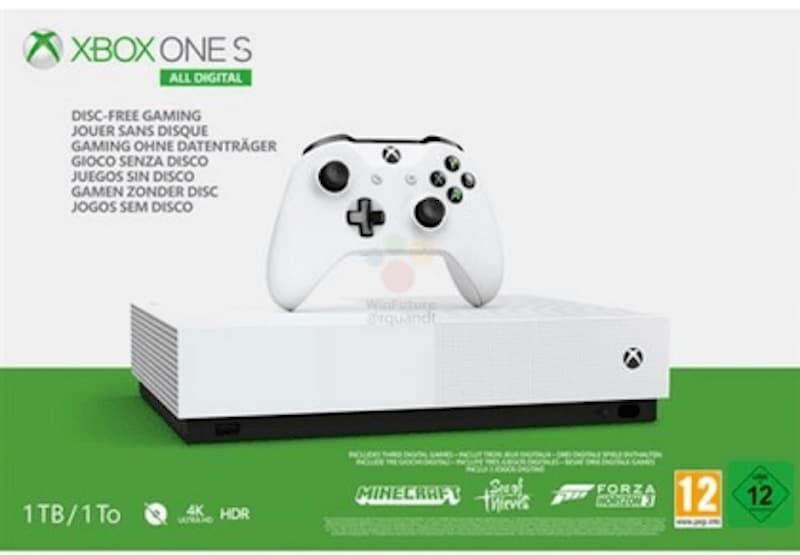 According to Winfuture the Xbox One S All Digital will launch for € 229.99, and come with a single Xbox One Wireless Controller in the standard color of white, and come bundled with pre-loaded games. The report also states that the disc-less Xbox will come with 1TB of in-built storage, support for 4K and HDR videos. That all matches up with leaked information previously shared by Windows Central, which has also published mock up images similar to the newly leaked ones. Buyers will be able to pick the bundled games before their console arrives. You can also sign up for Xbox Game Pass for access to over 100 Xbox One titles. We should see an official announcement later this week, as early as April 16th, with the European release reportedly set for May 7th. As the console is "disc-less" it is tipped to ship with pre-installed games, meaning that gamers could choose which games they want pre-installed before the console ships.